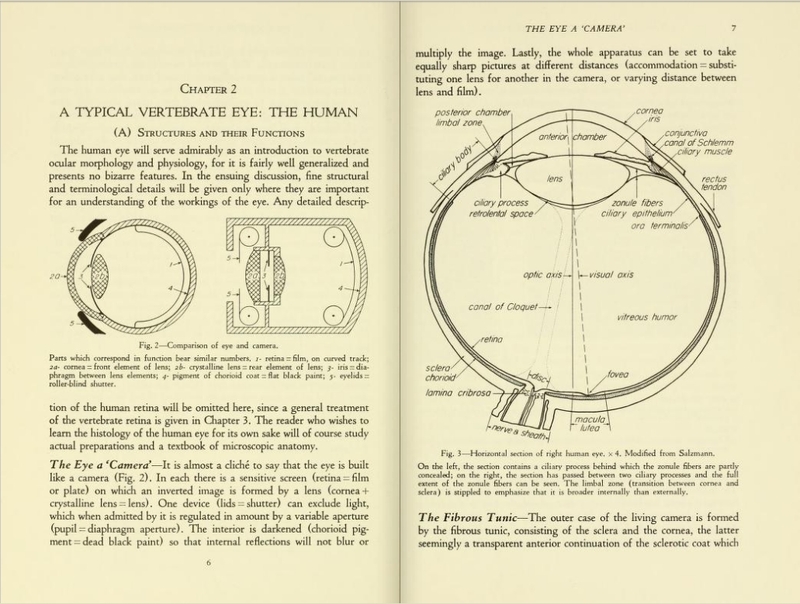 Here is a superb 700+ page treatise on the structure, function and evolution of the eye. The book The Vertebrate Eye and its Adaptive Radiation was written by Gordon Walls and published in 1942. The book is beautifully designed and typeset and includes dozens of very clear and well thought out illustrations. pressures for vision in different habitats. Gordon Walls was something of a renaissance man of 20th century vision science. Initially trained as an engineer, he took a masters degree in zoology, was an accomplished histologist and illustrator and taught visual physiology at Berkeley. Quite early in his career he wrote The Vertebrate Eye and its Adaptive Radiation. It is still the most comprehensive review of comparative anatomy of the eye. Gordon L. Walls died of a heart attack on August 22, 1962, at the age of fifty-seven in the midst of an active and unique career in science. He was writing a popular book, Everyman's Color Vision, had just finished a chapter on genetics for a book on children's vision (now to be dedicated to his memory), had at least two papers in progress (one of which was entitled Lightness, Darkness, Blackness, and--What's That Behind You? ), and was validating his inexpensive version of an instrument for the diagnosis of color vision defects. His interest in vision was confirmed during a four-year Research Associateship in Ophthalmology at Wayne University College of Medicine and culminated with the publication in 1942 of his book The Vertebrate Eye. This 785-page classic contains about 200 illustrations, many of which Gordon Walls drew himself. The Cranbrook Press printed only 1,000 copies, about 200 of which were given to him to cover some of his publication expenses. By 1950 the supply was exhausted and much in demand. Today it is an expensive collector's item, still the most authoritative reference on the subject. In 1942 Gordon Walls accepted a "war job" with Bausch and Lomb Optical Company doing research on vision with military optical instruments such as stereo-rangefinders. After the war he spent most of his time writing, ghost-writing and lecturing, all of which he enjoyed and did with excellence--but he longed to return to academic life. Ever since co-authoring a comprehensive monograph on intra-ocular color-filters of vertebrates in 1933 with Dr. Harold Judd, a leading Michigan optometrist, Gordon Walls had hoped some day to become associated with a university-affiliated school of optometry. Thus, his wish was fulfilled when Dean Kenneth Stoddard asked him in 1946 to join the Faculty of the School of Optometry at the University of California. He came to Berkeley as an Associate Professor of Physiological Optics and Optometry and Lecturer in Physiology and was made responsible for the graduate program in physiological optics. He also taught courses in morphology and physiology of the eye, physiological optics, evolution of the visual system, and color vision. With this position came tenure and the long-awaited opportunity to work in sportshirt without tie--he disliked formality and conformity. He was appointed Professor in 1952. During his fifteen and one-half years in Berkeley he established himself as one of the University's most engaging and enthusiastic lecturers, as one of the world's leading scientists in vision, and as a wonderful personality. His students and colleagues will find it impossible to forget him. Memories will persist--trying to win an argument with him; finding him in the student machine shop late at night making a fifteen-cent bracket; seeing him answer a graduate student's question with a two-hour lecture of unbelievable clarity; watching him drive his red Triumph with beret slightly askew; meeting him in the library when he was searching for a reference in response to a casual inquiry; noting the sparkle in his eyes when he spoke of his daughter, Istar; stepping around him on the stairs near the departmental mailbox as he sat reading his daily mail. Basically, he was kind and warm, but he was at great pains to conceal it. He transported hitchhikers, often rerouting for their convenience. He was a meticulous cook and solicitous host; ask almost any lonely graduate student. When one of his students was stricken with tuberculosis, he arranged for the collection of funds, but contributed most of them himself, to buy a television set for her convalescence. "Perhaps you will ponder for a moment the antiquity of vanity. Even if you are not so philosophical, you will at least dwell upon the antiquity of mirrors. Perhaps you will wonder what clever swain it was who first delighted his lady by bringing her a polished piece of metal, sparing her thereafter those frequent hurried trips to the glassy pool among the lotuses behind grandfather's tomb.
" But the inventor of the mirror was no hawk-nosed youth dreaming in the shadow of a half-built pyramid. Indeed, no man at all, but an armored shark gliding over the bottom ooze of the warm Devonian seas." In all, he published more than sixty journal papers and monographs, one book, and chapters to three other books. He was manuscript referee for three scholarly journals and sub-editor of one. He was a member of nine learned societies. Gordon Walls' standing in the history of science is perhaps anticipated by the fact that his portrait introduces one of the chapters in Sir Stewart Duke-Elder's 1958 book, System of Ophthalmology, Vol. I, The Eye in Evolution. The book begins with a frontispiece of Charles Darwin and elsewhere includes Johannes Müller, Casey Wood, Ernest Starling, and René Descartes. Like his famous company, Gordon Walls possessed a rare appreciation for the organization and beauty of nature. If, in the course of history, he fails to make the frontispiece, it will surely be a near miss. In many ways his life was like his own book. He said in the preface, "My conscience will be easier if most of my readers are glad that the book was not smaller."